Opinions may vary, but this week may have been one of the darkest weeks ever for the world of film criticism. Vary is what they are supposed to do though and it is both the point and the problem. It would be easy to just knock Warner Bros. over their screening plans for the most anticipated film of 2012 and sound like the bunch of entitled whiners that Kevin Smith thinks we all are. But we all share a portion of the blame for this week. From the studio that values the junket whore system more than any other to the first embargo jumpers down to the jump-the-gun commenters who have brought further scrutiny to the most recognized system of reviewing since Siskel & Ebert. This week�s Criticwatch folks, is about more than just a few worthless quote whores. The timeline for Warner Bros.� unveiling of Christopher Nolan�s The Dark Knight Rises began with their usual coming out party for the junket crowd; a majority collection of the worst reviewer/interviewers in a profession that is supposed to elevate the articulation about film, not reduce it down to a few key phrases. That was the weekend of July 6. Two weeks before the national release date with those in attendance given strict instructions not to leak their thoughts anywhere. Not even on Twitter, whose 140 allowed characters would be the equivalent of a full written review from most of them. Before that even took place though, invitations were placed in most markets revealing that their local critics would not be seeing the film until July 17, just three days before release. This included Chicago, the third largest market in the country. Those of us in the "isolated" Windy City (Ben Lyons' term for us) free from the direct marketing and influence of Hollywood (most with a few exceptions) have accepted - like even those of our brothers and sisters in New York and Los Angeles - that the pecking order involves the junkets and the trades getting their licks in first. Doesn't mean we won't continue to fight this antiquated thinking but it is what it is. When you begin dividing up the rest of us though is when it becomes time to truly let our voices be heard. A national embargo needs to be implemented - for any film that has not already premiered at a festival or overseas. The system can never be perfect when trying to balance fairness in this arena. As long as studios launch their product like Battleship and Ice Age: Continental Drift overseas first, they are going to get first crack at it. But so what? It's not like anyone in the U.S.A. is worried about competing with the duo from Urban Cinefile. And as long as films premiere at Sundance, Cannes and Toronto amongst others, we cannot prevent those with the privilege of attending them from getting the scoop months in advance. At that point it is pretty much Thunderdome. If the movie is seen, it is eligible for review. But then we get into films like The Hunger Games, The Amazing Spider-Man and The Dark Knight Rises. High profile films that movie fans are itching to read reviews of and ones that studios might be a little nervous about getting the first word out on. The embargo system has been in place for years and years. A studio invites a critic to a screening and they are usually asked to hold their thoughts until a specified date. Things have become a little dicey in the social media era, but then again the studios rarely enforced penalties on those critics who stretched the boundaries of ignorance by ignoring their wishes in full. So let's make it a little easier on those poor studio watchdogs who seemingly cannot monitor hundreds of reviews, even if it only takes a second to check Rotten Tomatoes and see the date when a film was reviewed (or at least posted there) and who did it. It's very simple, studios. Don't tell us that it isn't. If you want to have your little junkets and have four screenings each in Los Angeles and New York while only having one or two in other markets, so be it. Who cares when all the critics of a major city see the movie? Could be four weeks or four days. The amount of lead time to write a worthy review is another matter. What we are talking about is when that review can be released. That date is up to you. Whether it be the traditional day of release as it was many moons ago, the previous weekend or whenever, that is up to your discretion. Make sure that date coincides that ALL those that you normally invite to early screenings have had at least one opportunity to see it. If they miss the screening(s) that is on them. If they cannot write and publish as fast as someone, that's the way it goes. But until that moment they will be on equal playing field. If the set embargo date is going to be Tuesday before opening, make sure everyone has seen it by Monday. If it's going to be Monday, then Friday should be the latest national media day. None of this time zone crap. Don't set the embargo for New York while Chicago and Los Angeles are still watching the third act. And DON'T announce the embargo date after the fact. If you establish multiple options in a city and a critic decides the second screening fits their schedule better, they should not be punished by then being told they could have joined in the reindeer games with a review if they had only made the first screening. Screening plans should be made at the studio level and then passed down to their national, regional and local representation with an embargo date ready and stamped from the get-go. At this point, those with the general scoop on what might be considered the "B" team as far as professional film critics are concerned, might be ready to cry unfair. What about our hits? Why should we be punished? Who is punishing you? There's a good 95% chance that you will have seen the film further in advance than your competition and can have a review written and ready to post with a touch of button the second the timer goes from 11:59:59 to the established embargo date. With whatever fan base you have already developed, it should not be hard to maintain the same timely coverage that you have promised them in the past. And if you're writing is strong, your points well-made and you are honest with your thoughts, it is likely they will continue to come back. The counterargument at the studio level now may be that they choose who they want to see the film first for a reason. Yes, clearly the junket crowd get their first look because they are an easy lay and will do whatever you ask of them. It will be hard to implement this embargo rule by cutting them out of the equation completely. In the past I've always felt that once you open the floodgates by selling film with hyperbole-laced nonsense from quote whores, all bets are off. Which leads us to another reason why it may be in the best interest of the studios to lock down this new system. Forget the junket whores for a second and move towards what happened with The Dark Knight Rises this week. It is a common occurrence, especially on an anticipated blockbuster. The first reviews come in to Rotten Tomatoes. Heavily positive. Great start. Next thing you know there is the first negative one. This time it belonged not to perpetual aggregate aggravator Armond White, but to Marshall Fine, another New Yorker who then sparked a commenter fury on Rotten Tomatoes that included some awful threats. (Read his response to it and the awful Colorado shooting here.) This is far beyond studio control and not the issue I'm referring to. When the hype machine begins to roll, even with reliable trustworthy critics, there is almost certain to be a backlash - even within the critical community. While no one dare admit it, nor can definitive proof be offered to get inside a critic's head without a pattern of behavior, everyone knows it happens. Both ways. Positive-to-negative and negative-to-positive, there exists a need within some people's heads to be different and to disagree and nothing draws more attention than to be the first one out of the foxhole. Let me state for the record that, in no way, do I believe this was the intention of Marshall Fine who published his review amongst the very first spate of positivity on Monday, July 16. But what about the rest? Let us just look at this from a hypothetical standpoint without making the kind of blanket accusations that the Rotten Tomatoes commenters throw around. Say an "A-list" embargo has been established. It leads to 30-some glowing reviews off the top. Now the "B-list" finally gets to see the film, some of whom are fully aware of the praise it has received. Now who is to say if the next group of critics are responding more to the film itself or their expectations of a film hyped by their brethren? Again, the studios cannot be fully at fault for a film critic not doing the most fundamental of their duties, but they have created an environment that allows it to be possible. "I have no beef with Rotten Tomatoes. My intention was to make fun of irrational commenters, not of Rotten Tomatoes itself, which is a valuable site that I use all the time. The RT staff has to take the Tomatometer seriously; it's their job. They have to respond if someone tinkers with it. I can respect that. To boot me from the site entirely would be an overreaction, but I can understand why they were upset that I pranked the system." And a prank it was. To paraphrase Ernest Hemingway (via Midnight in Paris), "It was a good prank because it was an honest prank." Which makes one look a little more closely at Mr. Atchity's own statement. Some of the original language has been removed in regards to Snider's reputation, but here was something that did remain. "If a critic doesn't take their reputation seriously, then neither will we." The aggregate system has received the same kind of general criticism over the years that besieged the naysayers of Siskel & Ebert for "reducing" film criticism to a thumbs up/thumbs down "oh good, let's move on" mentality. Any discouragement of reading the actual review was never want Gene & Roger were about, nor is Rotten Tomatoes which invites readers with a taste of what to expect and then leaves it to the critics they have approved to supply the reasoning. Since there is no half-ripe tomato (or half-rotten for the pessimists) imagine a critic on the fence with an equal like and dislike of a film, but then opted for the rotten tomato because it would likely draw more traffic to their site. Does that expose a flaw in the system or a flaw in something greater? Let's take it the other way. 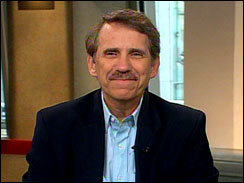 One of the first thoughts that popped into my head when the Snider ban came down for his "fake" review, was how come guys like Peter Travers and Pete Hammond would still be allowed to post. Sure we are skirting the line on what constitutes "fake" but please bear with us. Travers and Hammond do write reviews, which is why they are approved on the Tomatometer and gigantic whores like Shawn Edwards, Mark S. Allen and Joel Amos are not. The two Petes though write reviews with similar line-skirting though, transmitting average-sounding reviews with just enough hyperbole to get themselves quoted - or - working the hyperbole they have already provided into a review that isn't nearly as hot as they made it sound on the commercials. "OK, Brave isn't The Incredibles or Toy Story. So? It's still a rousing, gorgeously animated good time." SO? SO???!!!! You just said Pixar had outdone itself on the ads. But in the review you list two films that are better. Worse yet, nowhere in Travers' review does the phrase "Pixar has outdone itself" appear, if only to say they have upped their game in some smaller element of the overall picture. Does that sound like a critic taking their reputation seriously? Or one that any reader at Rotten Tomatoes should? Realistically, what can Atchity and his staff do with something like that since it is impossible to determine if the fake review is the lesser one posted there or the hyped-up independent snippet that appears on the ads. Or even at Rotten Tomatoes. Look familiar at all from Travers? Shall we refresh? I'm sure the Joseph Gordon-Levitt connection is just a coincidence. More? 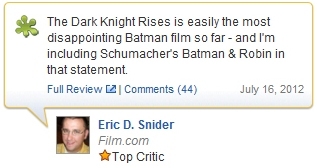 If the commenters at Rotten Tomatoes truly wanted to get their ire up, THIS is where it should be going. They want to prove just how much they care about critical opinion and what they might deem as unfair and false delineations on film, then their voices (and real names) need to be heard. Don't be idiots and threaten their lives, but make it known that their livelihood is wrapped in doubt. Demand something better. And if a pattern develops, you know that a particular critic is just not for you. It is very easy to find a collection of critics that share your voice and mindset. As suggested on Twitter yesterday by Ryan Adams of Awards Daily (@filmystic), it would be nice for Rotten Tomatoes to implement a feature to not only display "Top Critics" and "All Critics" but "My Critics." We can branch out into all sorts of discussion about more opinions making the world go round and a little discourse is a good thing. All for that. But these are movies, not politics, and even the most agreeable critics on your list are still going to disagree with you at least 30% of the time. It's time to get choosy too, but not at the whim of who the studios want you to see first. There is no reason that Ben Lyons should be seeing a movie before Roger Ebert. Disney already tried that, remember? If this indeed is a film "community" that us professionals purport to be a part of, then we need to all come together to urge them to take this proposal seriously. Remember that the nature of film criticism is to provoke discussion - and the first review out of the box has no one to discuss anything with. 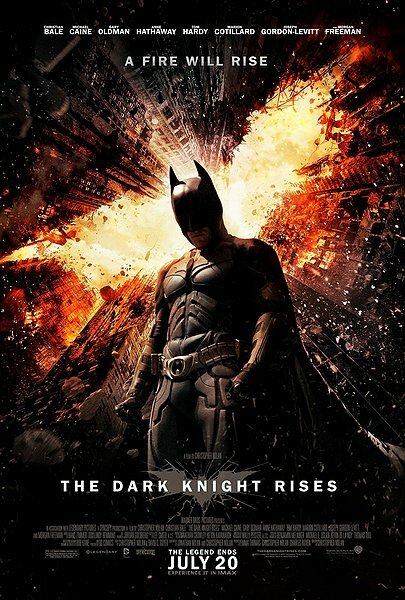 Just like The Dark Knight is mentioned as being a catalyst in the Academy's expansion of the Best Picture category, The Dark Knight Rises can be the film that opened up a more even playing field for the critics of the world. Call it the Dent Act for all I care. We need to fully ignore what comes out of the junkets and the trades and allow the discussion to begin with people (and only with people) who have seen the films and can speak intelligently on the subject without ruining the experience for moviegoers. Way too many critics wield the spoiler alert the way an Opti-Grabbed Carl Reiner wields the word "cut!" And that includes the 18 months of pre-coverage that is determined to spoil every cameo, plot twist and clothing fabric. This community cannot label themselves as true lovers of film if they cannot remember what led them to that love as a kid. A sense of mystery. A sense of joy. A sense of knowing that when your best friend or worst enemy told you how great a movie was, that you wouldn't be looking to have the opposite opinion just so you can get more seats filled at your lunch table. Let's all start working together because it's time for film criticism to rise again too.